Apple has been actively working on its iOS App Store, as it becomes the mainstream service of the company and the only single place from where iOS device users can download applications and games for their devices. Long time ago that Apple has made any changes to the UI of the iOS App Store for any iOS device, but now just ahead of the iPad 3 launch it is reported that Apple has start pushing slightly changes to its iOS App Store including the new UI elements for the iPad. 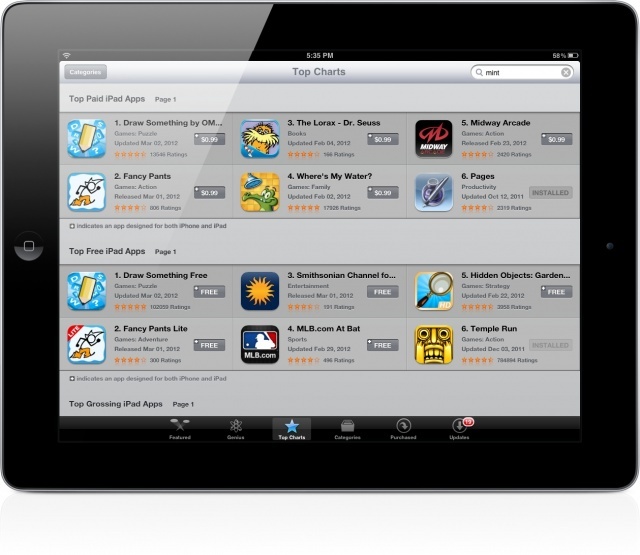 The newer iOS App Store is currently under the process, and will only be rolled out to the iPad users. The newer iOS App Store UI element update has just changed the way in which they show the top selling, paid, or free applications on the iPad devices. The new interface carries a horizontal scrolling style, which means that Apple has just dropped the older vertical scrolling style of the iOS App Store. However, it is noticed that the new small design change of iPad iOS App Store gains some speed improvement over the looking for content in the Store, and now brings the result more quicker than before. Now users don’t have to wait for couple of seconds to get their hands on the extended 25 applications on their iOS App Store, because the new UI elements of iOS App Store gain some improvement and load the result quickly. The new iPad iOS App Store UI update is currently not rolled out for everyone, as the updated UI of the Store is currently only available to number of users around the world, and might be kept secret for the iPad 3 launch prime time. There are many things coming soon on the tomorrow’s morning media event. Follow the event with us on our live coverage blog.